The following article is referring to the conversion of a CPT file to a PDF document by using a PDF converter such as the novaPDF driver. If you do not have novaPDF installed on your computer, use the Download page to download and install the application. The Corel PHOTO-PAINT application is part of the CorelDRAW Graphics Suite and it is a raster graphics editor with vector graphics import capabilities. It can also import different formats belonging to the competitors like Adobe Illustrator, GIMP, Photoshop, Paint Shop Pro etc. The CPT file format is native format to the Corel PHOTO-PAINT and it is proprietary, meaning that no other applications have complete support for this format except a few of the other Corel owned ones. The CPT supports layers, multiple channels, image effects and transparency to be added in form of objects. The language support for the application is pretty good as more than 16 languages are included. Still, the highly proprietary format and the inability of any other competitor to be able to at least import the format makes the CPT files very hard to work with unless you are a professional in the field of designing, drawing or visual presentations. So to be able to share the format with other people without requiring them download and install Corel's applications as well you will need a format with high portability such as the PDF one. By having the CPT converted to a PDF, you can greatly increase the interactivity with other users and the sharing would be a lot easier. Also with help of a PDF converter such as the novaPDF one, users can add additional elements to the file like signatures, security for sensitive data, watermarks, bookmarks, searchable content for the internet and many more. Open Corel Photo-Paint and search for your drawing by clicking on File-Open or by pressing Ctrl+O. After opening the file, make any modifications on it if needed and click File-Print or press Ctrl+P to prepare the file for printing. In the Print windows select the General tab and the novaPDF printer from the list. 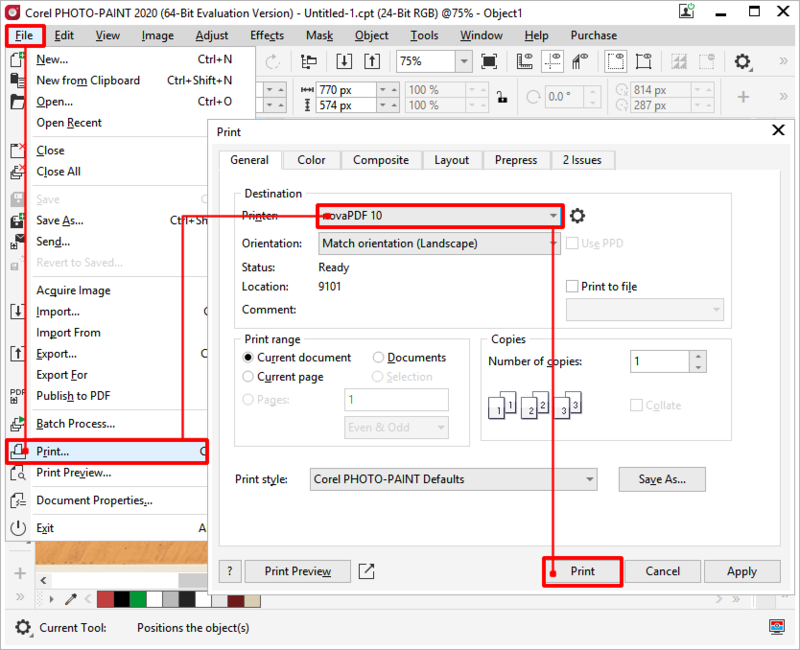 Click OK and the Save PDF File As will open to let you choose where to save the PDF file. First open the Presentation application and browse for the CPT file you want to convert using File->Open. Make any extra modifications to the file you need then select File->Print. In the Main tabchoose novaPDF from the Destination-Name section and click on Print. 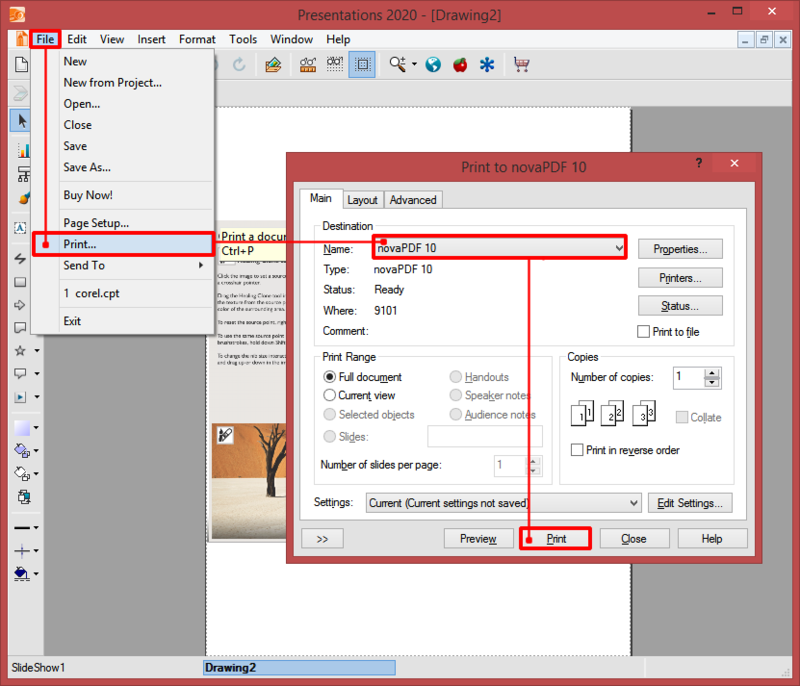 The Save PDF File As window will show up and allow you choose where to save the PDF file. novaPDF is a PDF converter that allows creating PDF files from any Windows application that supports printing. This tutorial shows some examples on how to convert to PDF from various popular Windows applications, as well as describing the general method for converting documents to PDF. This tutorial shows how to use novaPDF to convert an AutoCAD dwg file to a PDF document (with or without having AutoCAD installed). The conversion is done through a PDF printer driver such as novaPDF. If you do not have novaPDF installed, use the Download page to download and install it. The following tutorial shows how to convert a svg file to a PDF document by using the novapdf printer driver along with multiple applications capable of opening the svg file. If you do not have novaPDF installed, used our Download page to download and install the converter. This tutorial shows how to convert a Microsoft Office Word document to a PDF. novaPDF is a PDF converter that allows creating PDF files from any Windows application that supports printing.